Zack Jackson & The Cytherean Academy has finally made it on to Smashwords (and thus, will make its way into the eBook stores for Barnes & Noble, iBooks, and every where else their premium catalog delivers). In addition, I have fixed the files for Zack Jackson & The Cult of Athos and Iron Fist of the Oroqs, so those titles are also now included in Smashwords premium catalog. There will be no such delay with my next title, Zack Jackson & The Hives of Valtra. If you’ve been waiting to get them in ebook form, but don’t have a Kindle, now’s the time. And while you’re at it, if you have the time, vote for me for Best Local Author in Nuvo’s 2014 Readers’ Choice Best of Indy! I just found a new review up on Amazon for Wings of Twilight. It’s short and to the point, but the reader liked my novel enough to give it four stars! Thanks, Valued Reader! What a great way to start the week off after two days of Snowmageddon! I accomplished this goal! HUZZAH! It was released on June 9, 2013. I’m really happy with the way this novel turned out; I think it’s my best work to date. This goal fizzled. I wrote about 22,000 words and just could not get into the characters. The novel was supposed to, among other things, deal with the meeting, courtship, and marriage of the two main characters (against the backdrop of the main plot), but I could never quite figure out what Vasco could offer Aveline as a husband (other than companionship) that she didn’t already have. They just weren’t all that compatible with each other. An attempt to skip the courtship and have them be married at the start of the story didn’t help, either. I just wasn’t feeling it. I struggled with this most of the second half of the year before deciding to shelf the project. I accomplished both of these, though trying to get the formatting just right so their Meatgrinder (seriously, that’s what it’s called) software could process it just right for inclusion in their Premium catalog (which includes iBookstore distribution) was such a pain, I never finished it for Iron Fist and Zack Jackson. I haven’t had a sale on Smashwords since 2012 anyway, and I have yet to hit the royalty threshold where they’ll send me a check. I’m just not sure it’s worth my time to pursue this distribution avenue. I did this. I’ve sold two books through the Kobo Bookstore. It’s as good for me as Smashwords, though uploading to Kobo is easier because they don’t make me run my books through a proprietary software that mangles my formatting. I did this. It’s not been profitable for me yet, but it does have an advantage over the other distribution channels: I can tie all the formats together and let customers pick how they want the book. Right now, I only offer ePub, mobi, and PDF, but that probably covers 99% of e-readers. If I wanted to, I could probably set up a POD solution there, too, but I’m happy with CreateSpace for that. Besides, people haven’t exactly been knocking down my door for more options on Drive-Thru Fiction. I think I’ve sold 2 books through that venue. I did this. HUZZAH! The manuscript is currently with the first of my editors. It’s shorter than Zack Jackson & The Cytherean Academy, but it only covers a couple of weeks, rather than a whole school year. It’s very important to the metaplot of the series, though, and one can begin to see how things may develop. Of course, I’m not going to put any spoilers here, but I have some ideas that will take the series in a direction I think no one will be expecting (and hopefully not take it off the rails totally and leave people thinking “That’s it? WTF, man??”). When I wrote this goal, the novel I thought would be next is NOT the one I’m currently writing. Funny how that works. One thing that wasn’t a goal that I accomplished was the writing of my Seven Galaxies short story, “Forgotten Dreams.” It will be appearing in an anthology being released by the good folks at Fear the Boot, hopefully in the next month or so (it was originally slated for last month, but they’re still waiting on one story from a rather prominent author from the RPG industry…one whom will probably drive sales just by his inclusion, so I get why they’re waiting on him). Once it’s out, it will mean that my fiction is no longer solely the product of self-publishing (I style myself an Author/Publisher these days, thanks to Chuck Wendig). I also managed to get interviewed by three podcasts (Jennisodes, UnderDiscussion, and Sci Fi Pulse Radio, though that last one hasn’t been released yet). I hope to do more of them this year. I hate phone calls, but I love talking on podcasts. Figure that one out! To all my readers, thank you for your support in 2013! All I can ask is that you tell people about my novels that you enjoyed. Maybe throw up a review (it can be just a few sentences) or two if you haven’t done so. Apart from actually buying my books (which, as readers, presumably you’ve already done), it’s the absolute best thing you can do for me, or any author for that matter. Word of mouth helps. 2012 was quite a year, wasn’t it? Aside from personal life events, I managed to publish Iron Fist of the Oroqs and Zack Jackson & The Cult of Athos, despite being somewhat late on both of them. 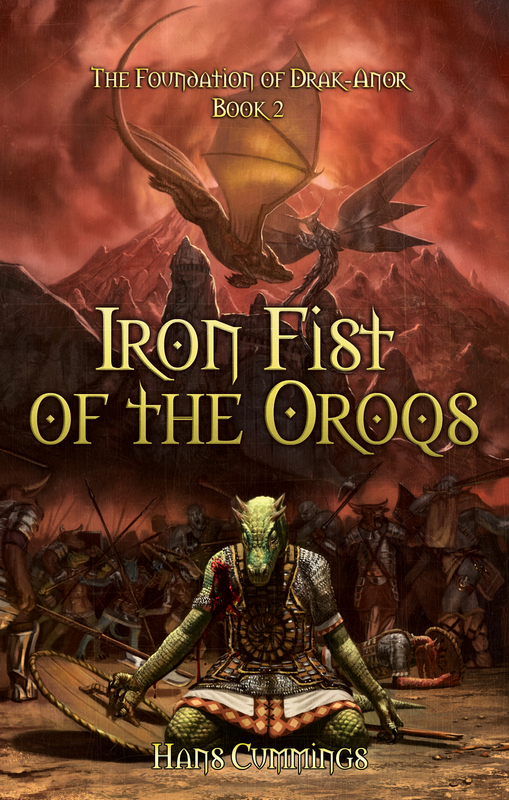 I’d like to say “this is the year my books really took off,” but I’m satisfied with having given away over 700 books between Wings of Twilight and Iron Fist of the Oroqs during the two Kindle-exclusive promo periods I ran. That’s a lot more people than I know personally, so hopefully, word will start to spread about my novels. I’m just happy people I don’t know are reading my books. I hope they’re enjoying them. You’ll notice I didn’t mention the iBook store for platforms on which I plan to release my books. I would like to, but all of my research thus far indicates that you have to use Apple’s software and it’s only available for Mac OS PCs. Well, I’m using a Windows 7 machine, and I don’t plan to purchase a Mac anytime soon. I think Smashword’s expanded distribution eventually reaches iBooks, so maybe I don’t have to worry about that, but they take a cut of my royalties. I’ll have to look into it further. 2013 is going to be busy. Here’s hoping I can keep to my schedule and get into a rhythm that will let me release two books a year (late spring & late fall)! All of my fantasy fiction (at least, for now) will take place in the same fantasy world. 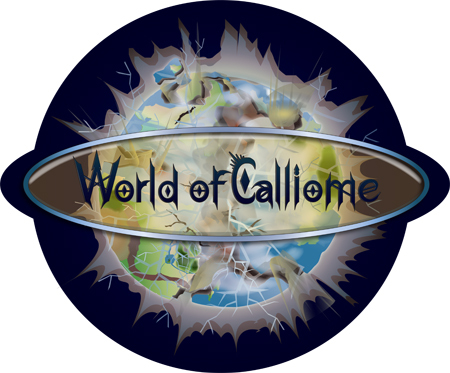 Since I don’t have a contract with a company that has a shared world for which I can write, I had to come up with my own world: the World of Calliome. I’ve been working on bits and pieces of this world for probably twenty years now, though a lot of it has changed since I started. 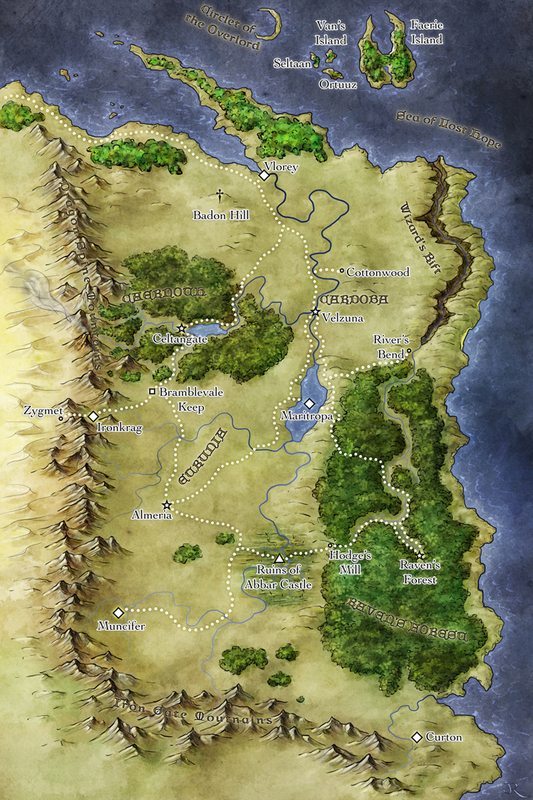 Each novel set on the World of Calliome will reveal a little more about the world, particularly about the little corner in which each story is set. The good thing about having my world is that I don’t have to worry about someone else writing a world shattering event that totally screws up my plans. I have a lot of notes. Hopefully, this will help give a sense of continuity to my stories and a sense that there’s a history and more going on in the world that just what you’re reading about at that moment. Not all the stories will be directly related to each other, but it is my hope that by throwing in nods and references here and there, it’ll help it all seem more real. Logo by Gwyneth Ravenscraft. Her professional website isn’t active yet, but it will be within a month or so, I’m told. The logo went from rough concept to completion over the course of a weekend; she does quick work and I’m thrilled with the results. It’s like my mock-up, only, you know, GOOD. Kale and Delilah are siblings. Twins, in fact. Kale is a talented engineer and trapsmith. Delilah is a sorceress with a particular fondness for boggins (small furry balls of hunger and pointy teeth generally considered to be nuisances). What makes them special among draks is their striped scales. Stripes are very rare among the draks and considered a good omen. So good, in fact, that many drak clans call striped draks “Children of Destiny.” Cynics will tell you prophecies hold no water, but there are still some dreamers in the world. Kale and Delilah’s clan have mixed feelings about the twins, though. Being striped is very good, being twins born of the same egg, that’s considered a bad omen. Normally, twins are exposed; left to die in the harsh reality of the world before they’re old enough to fend for themselves. They were reluctant to do that to Kale and Delilah, though, due to their stripes, so they were raised in the clan until they were of age, then exiled. 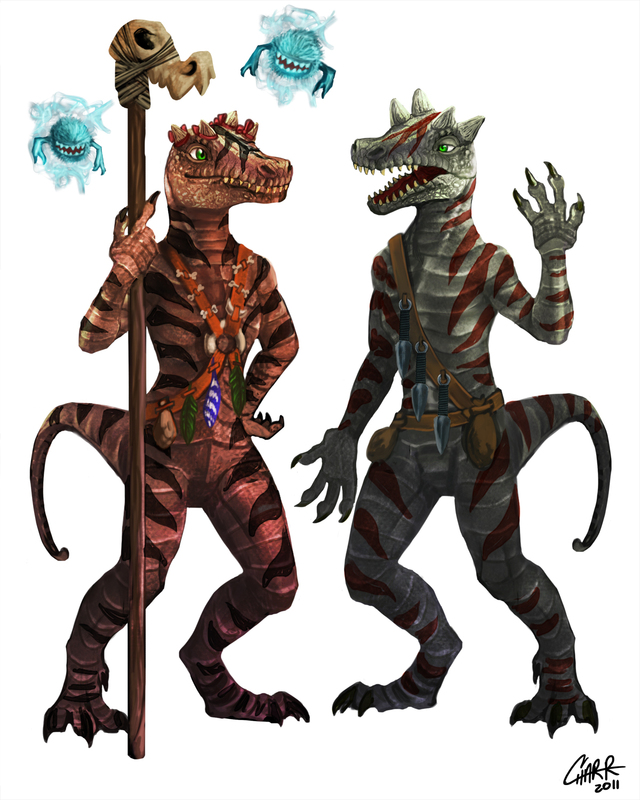 Now they live and work in Twilight Dungeon, looking up to Sarvesh and Soterios as sort of older brothers and protectors. 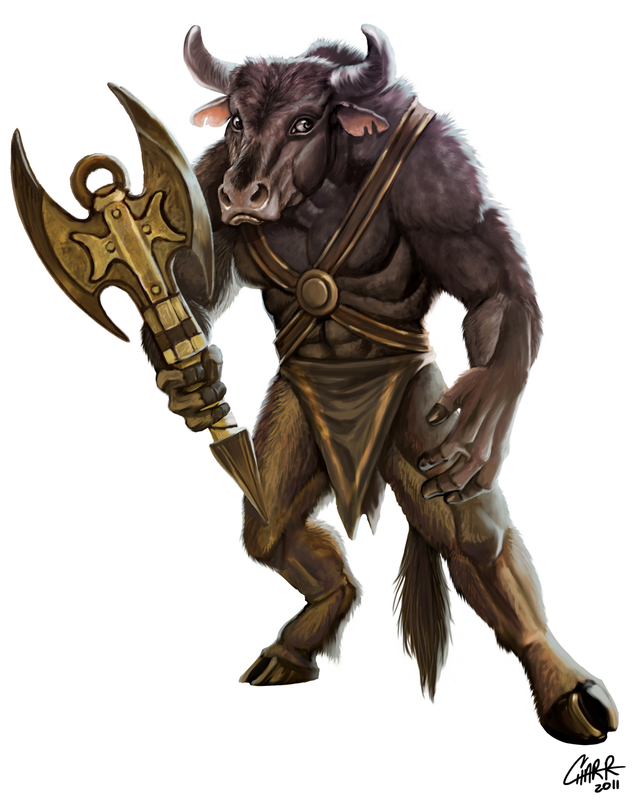 One of many minotaurs living in a labyrinth within Twilight Dungeon, Soterios is Marshall Sarvesh’s second in command. He worries about others more than he should and is known to hit the bottle far too often. Still, he is loyal to Sarvesh and his duties as a Twilight Defender.